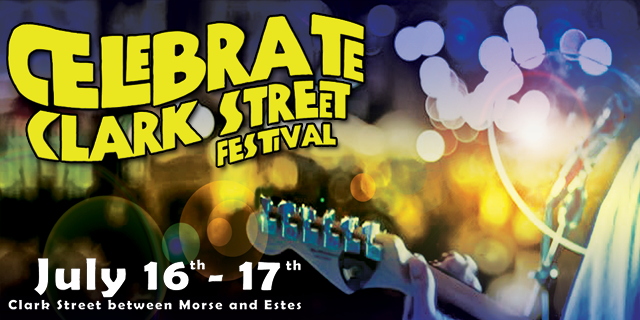 Join us this year for the 11th Annual Celebrate Clark Street World Music Festival! We are celebrating COMMUNITY, DIVERSITY, DANCE, FOOD, MUSIC, CRAFTS & ROGERS PARK! The Celebrate Clark Street World Music Festival is acclaimed by the Chicago Reader for its eclectic lineup of world music, curated by Sound Culture Center for Global Arts. Celebrate Clark Street World Music Festival is located on Clark Street between Morse Ave. and Estes Ave. in Rogers Park. A small donation of $5/person | $10/family is requested. Son Monarcas (kids) | Chicago | 1 p.m.
Vivian Garcia | Soul Flamenco Blues | Chicago | 3 p.m.
Krar Collective | East African Dance Music | Ethiopia | 5 p.m.
El Freaky DJ Collective | Tropical Bass | Colombia | 7 p.m.
Sierra Leone’s Refugee All Stars | Soukous/High Life & Reggae | Sierra Leone | 9 p.m.
Moco Loco (kids) | Colombia | 12:30 p.m.
Hector Guerra | Tropical Bass MC | Spain/Bolivia via Mexico City | 2:30 p.m.
Chicago Samba | Samba | Chicago/Brazil | 4:30 p.m.
Four Star Brass Band | Brass | Chicago | 6:30 p.m.
Los Vicios de Papá | Latin SKA | Mexico/Chicago | 8:30 p.m.
Future Hits (kids) | Chicago | 1 p.m.
Akasha | Reggae | Chicago | 3 p.m.
UGOCHI & A.S.E. | Afro Soul | Chicago | 5 p.m.
Gaby Moreno | Singer Songwriter | Guatemala | 7 p.m.
PALENKE SOULTRIBE | Electronic | Colombia | 9 p.m.
Grupo Brebaje | Tierra Caliente | Chicago | 1:30 p.m.
Sangre Michoacana | Tierra Caliente |Chicago | 3 p.m.
Trio Mokili | African Jazz | Chicago | 4:30 p.m.
¡ESSO Afrojam Funkbeat | World Beat Jam | Chicago | 6:15 p.m.
Chicago Afrobeat Project | Afrobeat | Chicago | 8:15 p.m.
Visit our Facebook Event Page and website for more info at www.celebrateclarkstreet.com!